Maybe only librarians can appreciate today’s post. Or maybe only people who appreciate grand design and history. On my travels, I’ve wandered into many a dusty old library in search of that awe-inspiring experience. As a librarian (first career), I’ve always been on the prowl for a library straight out of the medieval era – sweeping, arched ceilings covered with colourful Biblical scenes or portraits of Greek philosophers; rich oak-panelled shelves scaling up the walls, groaning with the weight of priceless manuscripts or woodcuts; shards of light piercing through stained glass windows and softly illuminating a bookstand in the middle of the library, displaying one of Gutenberg’s Bibles. 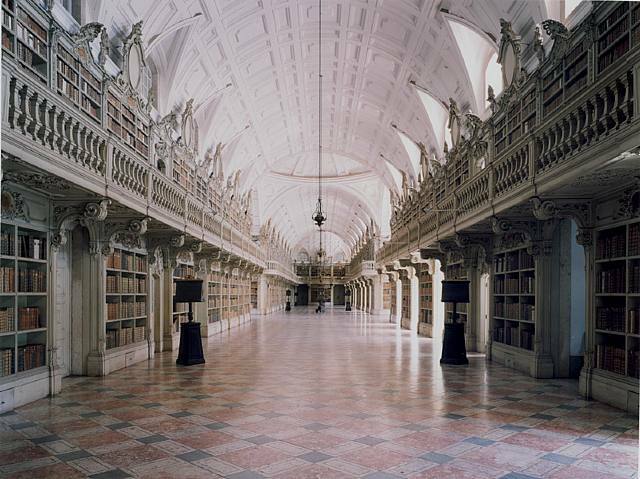 I came across such a library in Portugal in 2004 – Biblioteca do Palacio e Convento de Mafra – with marble floors and elaborately carved mezzanine balconies. Very grand. Very Portuguese. I was looking for a photo of this library the other day (duh, didn’t have my camera with me on that 2004 trip). 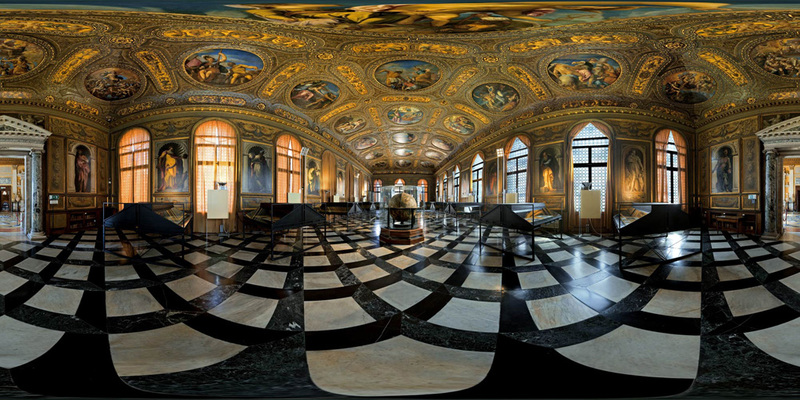 And I stumbled onto a curious blog with an array of stunning photos of libraries around the world. The curious blog? It’s called Curious Expeditions: Travelling and Exhuming the Extraordinary Past. A welcome addition to my RSS feeds. 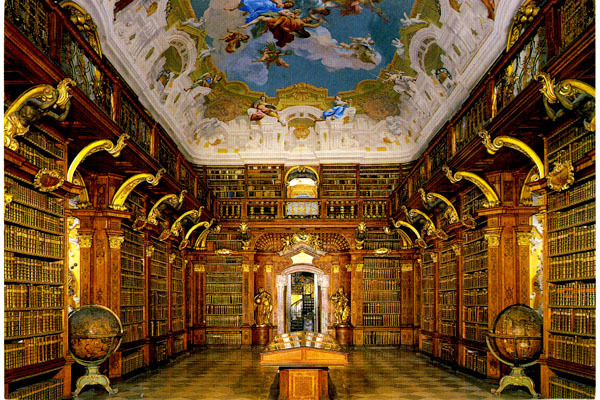 Not to mention the simply glorious Melk Monastery Library, Melk, Austria – gleaming with gold! Go here to see all the wonderful photos on the Curious Expeditions blog – I’ve never seen so many beautiful spaces. It’s enough to make me consider going on a Grand Tour of Libraries in 2008! Update: ThinkingShift good friend, Patrick Lambe, over at Green Chameleon has reflected on the Library of the Abbey of St Gallen image and posted a thoughtful piece on the sustainability of our digital knowledge world. 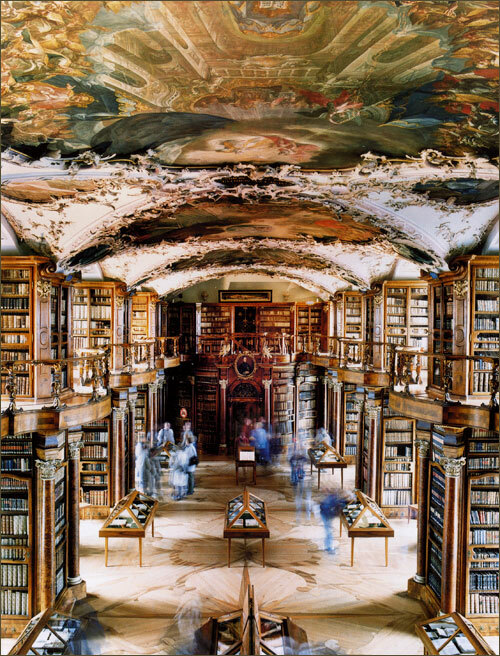 Indeed, the image of this library (above) almost contains two worlds – the figures seem to be rushing through the library, fleeting, blurred images in the moment; the books are solid, static, preserved in time. Thank goodness: I’m not an addict! RFID: a danger to your health? Ohhhhh to have a good book and a corner of these old libraries. Just magic!